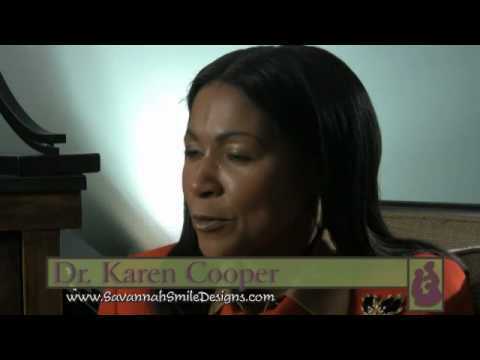 – Dr. Karen Cooper, your cosmetic dentist in Savannah, GA.
I’ve always loved helping people feel better. Ever since I was little, I’ve been a “caregiver,” and as a dentist, I can give the greatest level of care for my community – self-confidence and true well-being. I don’t want you to live with a fake-looking smile, and I don’t want you to have to pay more money down the line because of failed restorations, pain, or discomfort. I continually do all I can to become a better restorative, cosmetic, and family dentist in Savannah. Studies at the Pacific Study Continuum and went on to become a clinical instructor in cosmetic and smile designs. Dr. Cooper spearheaded her team to complete hundreds of hours in continuing education and training in becoming better restorative, implant, family, and cosmetic dentists in Savannah. She has touched hundreds of lives with her burning passion for better healthcare and invigorating smiles. Having both parents from the South and studying in different parts of the country, Dr. Karen Cooper has made friends in every culture. She never meets a stranger and knows how to make people, even those who are most apprehensive about dentistry, relax and feel at home. Why do I choose to be a Savannah Dentist? When I do something, I make sure I do it right. When it comes to dentistry, I go the extra mile to make your smile look and feel beautiful and unique. I work long hours to make sure your smile highlights the best aspects of your facial features and your personality. I never charge extra for going the extra mile with my patients because that’s not the reason why I do this. Just knowing my patients will feel more confident about themselves, will feel happier, and be more expressive and assertive about their goals is the reason why I come to work every day. How Can Dr. Cooper Help You? Talk with your Savannah dentist today!